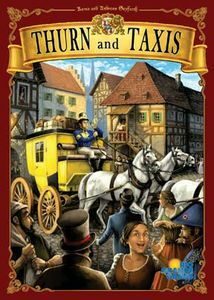 Thurn & Taxis will be a featured Meeple League game for the first time with the inaugural online tournament of 2017. Andreas and Karen Seyfarth’s game of route building and card drafting in Bavaria. Published in 2006 by Hans im Glück Verlags-GmbH. The English edition is from Rio Grande Games. The game is currently out of print. Thurn & Taxsi will be the inaugural online tournament game for the Meeple League! Signup is available.